This dinosaur cushion is great for boy’s bedrooms. There is no tricky colour-work to do as the scales, eyes and spots are knitted separately and sewn on to the finished cushion. 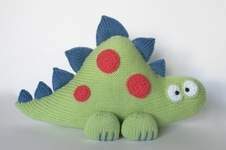 PLEASE NOTE: This listing is for the knitting patterns only; this is not a listing for a finished dinosaur. TECHNIQUES: All pieces are knitted flat (back and forth) on a pair of straight knitting needles. You will need to cast on and off, knit, purl, work increases and decreases, and sew seams. This pattern also incorporates kitchener stitch grafting. FINISHED SIZE: The finished dinosaur is approximately 38cm long and 28cm tall.